A group headed by John Bolton said an anti-racism task force blamed the press for anti-Islam violence. The European Union ordered reporters to not reporting whether a terrorist is Muslim. In November 2016, rumors began to swirl that the European Union had ordered the media not to report when terrorism suspects were Muslim, presumably because of pressure from Islamic groups. The institute is headed up by John R. Bolton, a Fox News contributor and former U.S. ambassador to the United Nations who is reportedly under consideration by President-elect Donald Trump as his secretary of state. The allegation is taken from a report published a day earlier by the European Commission against Racism and Intolerance (ECRI), which was commissioned by the Council of Europe to monitor human rights abuses. However, Bolton’s group failed to note that the council is a separate organization from the European Union, and it issued a recommendation, not a mandate. The ECRI report establishes a direct causal link between some tough headlines in British tabloids and the security of the Muslims in the UK. In other words, the British press is allegedly inciting readers to commit “Islamophobic” acts against Muslims. 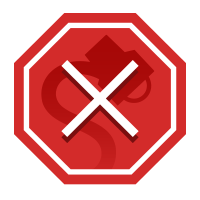 ECRI regrets that a way has not been found to establish an independent press regulator and that, as a result, certain tabloids continue to publish offensive material, as indicated above. ECRI urges the media to take stock of the importance of responsible reporting, not only to avoid perpetuating prejudice and biased information, but also to avoid harm to targeted persons or vulnerable groups. ECRI considers that, in light of the fact that Muslims are increasingly under the spotlight as a result of recent ISIS-related terrorist acts around the world, fuelling prejudice against Muslims shows a reckless disregard, not only for the dignity of the great majority of Muslims in the United Kingdom, but also for their safety. In this context, it draws attention to a recent study by Teesside University suggesting that where the media stress the Muslim background of perpetrators of terrorist acts, and devote significant coverage to it, the violent backlash against Muslims is likely to be greater than in cases where the perpetrators’ motivation is downplayed or rejected in favour of alternative explanations. The Teesside study, which covered the period between March 2014 and February 2015, found that instances of anti-Muslim violence in Europe and Australia increased in the seven-day period immediately after terror attacks, compared to the seven days before. However, that report also stated that there were fewer Islamophobic incidents in Australia following the attack on a Sydney shopping mall in December 2014, pointing out that the reporting focused on the attacker’s history of mental instability and not his religion. While the ECRI did call for an “independent press regulator,” it also stated that it did not want government officials “encroaching on [media outlets’] editorial independence the need to ensure that reporting does not contribute to creating an atmosphere of hostility and rejection towards various minority ethnic groups.” It also said that media practices in the UK had already been criticized in the Leveson Inquiry, a government probe that took place after revelations that News International (owned by Fox News CEO Rupert Murdoch) engaged in phone-hacking and other dubious practices. Bolton’s organization also failed to note that the ECRI’s report contained 23 recommendations for the U.K. government, covering not only how to deal with Islamophobia, but ways to integrate refugees arriving to England and Northern Ireland, as well as Romani groups. Mamou, Yves. 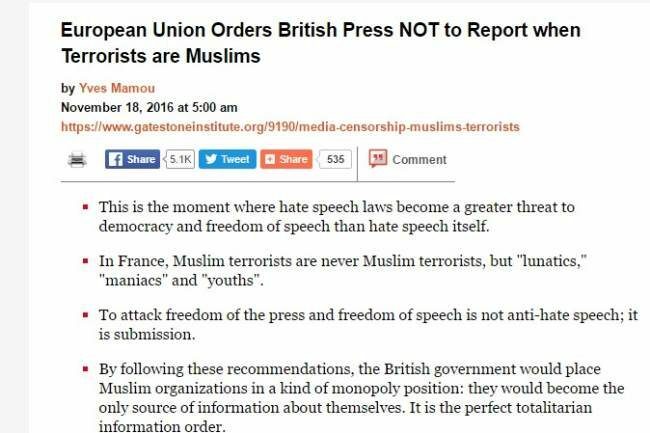 “Council of Europe Recommends British Press NOT Report when Terrorists are Muslims.” Gatestone Institute. 18 November 2016. Conway, Madeline. “Bolton calls regime change the ‘only long-term solution’ in Iran.” Politico. 17 November 2016. Dathan, Matt. 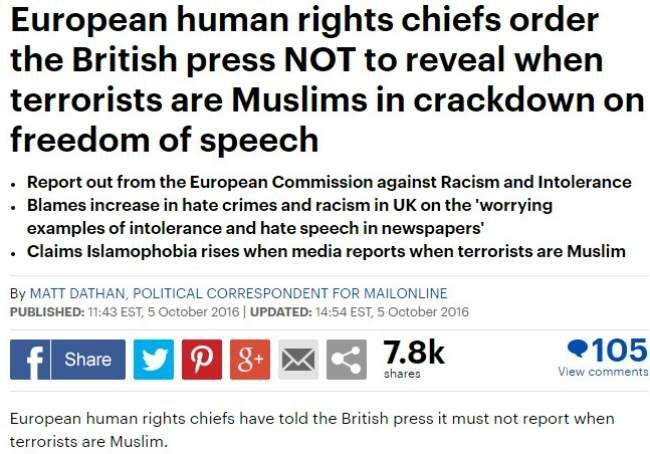 “European human rights chiefs order the British press NOT to reveal when terrorists are Muslims in crackdown on freedom of speech.” The Daily Mail. 5 October 2016. European Commission against Racism and Intolerance. “ECRI Report on the United Kingdom (Fifth Monitoring Cycle).” Coe.int. 4 October 2016. Teesside University. “New report reveals a rise in anti-Muslim hostility in Britain following acts of terrorism around the world.” www.tees.ac.uk. 18 June 2015.